Weather Data is not available for this post because I am writing from the Biloxi/Gulfport Airport. Tim Martin, Chief Boatswain, aboard the OREGON II, left his home near the Missouri River in Missouri for a life at sea and has never looked back. Like many young people from the Central United States, he joined the Navy as a way to travel and see the rest of the world. He was stationed on Whidbey Island in Washington State and when he left the Navy he became a commercial fisherman working out of Seattle to fish the in Bering Sea from Dutch Harbor, Alaska. Tim left the west coast and the world of commercial fishing to join NOAA and worked for several years on ships out of NOAA Woods Hole Station in Massachusetts. Eventually, through connections he made on the job, he was able to transfer to the Southeastern Fisheries group. He has worked on several ships, but has been on the OREGON II for 12 years. Tim likes his job for the variety and activity it provides, as well as opportunities to apply his mind to ways to make things work better or more smoothly. He attributes much of the good working atmosphere on the ship to the stability of many crew members who have worked together for years. As a long-time civilian mariner with NOAA he appreciates the importance of believing in what you are doing and being committed to being successful. But, Tim Martin is not so one dimensional that you can know him as just a mariner. Talking with him I learned that he is a voracious reader with very eclectic tastes in literature. He devours everything from travel accounts to true adventure, biographies, and historical accounts of exploration and settlement of the world. He has traveled broadly and uses his reading time to continue to learn about the places he has visited. He is a licensed diver and enjoys the underwater world as much as sailing on the surface of the sea. I was fascinated to learn that he has dived to authentic pirate wrecks…quite a change from his underwater beginnings in the dark and brackish Pascagoula River. Tim is a great example of someone who recognizes that his only limits are the ones he sets for himself. That is a great legacy to leave for his family. Chris Nichols, Lead Fisherman, got into marine work for the adventures. Growing up he read classics like “Captains Courageous” and “20,000 Leagues Under the Sea.” His years as a Boy Scout helped empower him with a can-do attitude that kept him from quitting when things got difficult. After a mediocre high school career and his childhood years in West Palm Beach, Florida, hanging around the docks and fishing, his quest for travel and adventure led him first to commercial fishing and then to join the Navy. After six years in the service, including training in water rescue, Chris left the Navy and started classes for work in the merchant marine industry. As he worked toward earning his 100 ton master rating he discovered that using math, which had seemed unimportant and boring in high school, was critical for navigation. Applying the things he was studying to real world problems made learning important. The life-style structure of his military years helped him move fairly seamlessly into the shift work that became his routine aboard merchant ships. The travel fed his sense of exploration and adventure. Now, after 20 years working either on NOAA ships or for companies that contracted with NOAA, Chris still loves his job and his life style. His experience in the merchant marine gave him the background to understand working on ships from the viewpoint of the wheel house and the deck. He patiently explained to me that the job titles of people working on the deck crew are just positions for which eligible Able Bodied Seamen were hired. They are not classification by skill or experience; they are job descriptions. Each survey watch requires 3 crew members on deck to work equipment and support the scientists in deployment and retrieval of lines. Cooperation and communication are the most critical skills needed by everyone on the ship for success in carrying out their mission. “NOAA has recently been experiencing a lack of interested, qualified applicants,” Chris told me. “I think many young people lack the sense of adventure that makes life at sea attractive.” He certainly demonstrates that desire for adventure: his eyes light up and an infectious grin spreads across his face as he talks about the places he’s been and the places he still wants to go. The whole deck crew, including Chris Rawley, Mike Conway, Chuck Godwin, and James Rhue, are a lively, hard-working bunch. They do their jobs, they have some fun doing them sometimes, and they like what they are doing. Every time I was around them I could hear John Fogarty’s song “Rambunctious Boy” playing in my head and I ended up smiling and humming along! Thirty-six years ago Rich Brooks took the advice of his high school math and history teachers and enrolled at the Massachusetts Maritime Academy. The strict structure of the Academy helped him develop his study habits and learn the discipline needed to raise from a low C student a B+ student who took pride in his work. He graduated with a degree in Marine Engineering, but spent time as a substitute teacher while deciding where he wanted to go with his career. Currently he holds 3 chief engineer licenses: steam, motor and gasoline and is qualified to operate any watercraft. Eventually he started working on ships, spending a number of years in the Merchant Marine. He worked on merchant transport ships contracted to our government to support Operation Desert Storm and Operation Iraqi Freedom in the Persian Gulf. For 10 years he worked on independent oil tankers on the West Coast, transporting oil and gasoline to and from various ports. He has been a 1st Engineer for NOAA for 2 years. Rich enjoys the travel and adventure that are part of his career. He likes visiting different cities and has been through both the Suez and Panama Canals in his travels. It has been a long journey around the world from his childhood home in Haverhill, Massachusetts to Mobile, Alabama where he made his home base for the last 25 years. He is proud that his work as an engineer has influenced his son to pursue a career in engineering, following his father’s example of hard work and sacrifice as the way to get ahead in life. Rich hopes to see more young people turn to careers in engineering, knowing as he does that the average age of marine engineers in this country is 58 years which means there will be openings for young people as they complete their training. As for him, when he retires several years in the future he looks forward to moving closer to his father in Florida, going fishing and playing golf. My roommate, Chrissy Stepongzi, is a marine biologist and the person of whom I saw the least on this cruise. She knows her job and was always eager to answer questions. We just did not see each other often to talk because of being on opposite shifts and sharing the room. She slept while I worked and visa-versa. I appreciated her quick smile and well-developed sense of humor and wish we had been able to get better acquainted. Fisherman Mike Conway has been working on ships for a long time. He loves the ocean and loves the travel. His willingness to make sure I learned and got opportunity to see things was really helpful and made me feel welcome. Mike was always willing to grab my iPad and take pictures so I could be in them and he was the one that made sure I got to see the sky at night and appreciate the beauty of being on the ocean in one more way. Fisherman Chris Rawley, quick to grin, but slow to talk, took some effort to get to know. Chris was a fisherman on our shift and helped with everything from running the crane to pulling lines to wrestling sharks. He was “born under a wandering star,” and loves to travel. He’s a gypsy at heart. James Rhue is another fisherman working on the deck crew. He too was with the night shift so we didn’t cross paths often. When we did talk he could always answer my questions and made me feel welcome. Mike, Chris, and James are pictured in the Deck Crew photo above. Mary Stratford was filling in on the deck crew this cruise. She lives in Puerto Rico where she is a ceramic artist, but much of her life has been spent working in jobs that allow her to see the world. Mary was helpful and friendly and always interesting to talk to. 2nd Engineer Darnell Doe, the quiet, friendly guy I ate breakfast with most mornings. We shared a little conversation and watch the news over a quick bite to eat and a cup of coffee. I never turned out into a formal interview and didn’t take notes on our casual conversations. 3rd Engineer Sam Bessey was filling in a temporary vacancy. He is a recent graduate of an academy in Maine and worked the opposite shift of mine so we had a few chances to talk a little, but not enough to call an interview. I do know he wants to head for Hawaii and try to find work there after this cruise, but will head home to Maine to see family first. Good luck in your new career Sam. Roy Tolliver was our tech person. I most often saw him walking from place to place on the decks, checking on electronic equipment and trying to troubleshoot computer problems when they arose. Roy has worked on ships for many years and has been many places around the world. O C Hill, Listed on the staff roster as a “wiper” was another one of the people who kept the ship running. Our interactions were limited to friendly smiles and greetings. When folks work in the engine room it is hard to find a time to talk with them, especially if shifts don’t match. Valerie McCaskill, our cook and one of the most important people on the ship. I know she has a daughter she was eager to get home to see. I know she had very little warning that the previous cook would not be on this voyage so she had to step in in a hurry. I know that she has a beautiful smile and makes legendary macaroni and cheese! She kept us very happy! Chuck Godwin would normally be working on this ship as a skilled fisherman on the deck crew, but he worked in the kitchen with Valerie this trip to fill an important empty spot and keep us all well-fed. His irrepressible sense of fun and lively conversation kept us all hopping. His career has spanned time in the Coast Guard as well as years with NOAA. His is a proud new grandpa. That I did not get to know everyone on the ship is my loss. Everyone that I met was friendly and helpful. It was a true pleasure to meet and work with these great people. Meet Lisa Jones, a career marine scientist who came to her present position as a Research Fisheries Biologist for NOAA from a life of working with animals. Born in Memphis and raised in the mountains of east Tennessee, she did her undergraduate work at Emory University, and then earned her Master of Science at East Tennessee State. Lisa has lived and worked in Colorado where she trained horses for a while. She moved to California and worked for the Department of Fish and Game to earn money for grad school and eventually ended up in at the National Marine Fisheries lab in Pascagoula, Mississippi. She started there as a student intern and 19 years later is working as a research scientist for NOAA. Her schedule of being out on the water during the summer and home during the winter months suits her well. Ten years ago Lisa got interested in doing agility training with a rescue dog she kept, an Australian Shepherd. Since then she has acquired 3 more Aussies through rescue and adoption (one dog left homeless by Hurricane Katrina.) Lisa’s interest in dog training and agility trial competition helps her recharge her energy and enthusiasm each winter so she is ready to go back to sea in the spring. Her big goal is to make it to the national agility dog competition trial with her Aussies. Lisa has been my go-to person for everything I needed to know about living and working on the OREGON II. From making sure I met everyone, to teaching me to use and care for our equipment, to teaching me to cut mackerel and bait hooks, she has been right there. The success of this experience for me has been mostly due to having good teachers and being with a group of people willing to share their experience and expertise. Kevin Rademacher, Fisheries Research Biologist, started out riding dolphins at Marine Life in Gulfport, Mississippi! He spent several years doing dive shows and working with performing marine mammals before he got into research work. Kevin was graduated from University of Southern Mississippi with major emphasis in biology and fisheries science and a minor in chemistry. After graduation he worked restoring antiques with his father while he applied for jobs in the marine science industry. Kevin started out on NOAA Ship CHAPMAN, a 127’ stern trawler. In 1988 he spent 240 days at sea as a survey technician while earning certifications with survey equipment, deck equipment, as a diver, an EMT, worked the helm watch and corrected charts. Then he moved into the lab working with the marine mammal group, ground fish and reef surveys. He has chosen to continue working on reef fish surveys because it gives him the opportunity to work with cutting edge equipment like underwater cameras as they have evolved from simple video to using sophisticated arrays of four sets of camera groups, each cluster including a stereo black and white set and one color camera to give the fullest possible depth and detail 360⁰ images. Underwater work is Kevin’s main interest, but there are only so many research biologists so his job assignments have been varied. It was fortunate for me that he was assigned to work on the long-line survey this trip so I could learn from him. During my time on the OREGON II Kevin has been a willing source of any information I request about the marine life we are seeing. He has a copious memory for facts and an encyclopedic knowledge of the appearance, habits, and names of the animals in the ocean. No matter what we brought up on our hooks, bony fish, sharks, algae, coral or shellfish, he knew them by common and scientific name and provided interesting facts to help me remember them. Kevin’s passion for his job is obvious in the way he attends to details and shares his knowledge. His irrepressible sense of humor made the afternoons baiting hooks with smelly fish in the hot sun an adventure instead of a chore. Trey Driggers, Research Fisheries Biologist, first got interested in aquatic animals because of alligators. Growing up on a lake in Florida he was constantly warned to stay away from the water because there were alligators…the kind of warning guaranteed to intrigue any curious youngster. About then, the movie “Jaws” was released and the media blitz that accompanied it drew his imagination toward an even scarier predator. His interest grew and he remembers two books in particular that kept it alive: “The Dictionary of Sharks” and “Shark Attack.” From that point on his career path seemed to point straight toward marine biology. Trey put in four years studying a basic liberal arts program at Clemson University. He remembers a Smithsonian presentation called “Shark in Question,” which had a chapter addressing the question “How can people become shark experts.” He entered the University of South Carolina and spent 2 years taking nothing but science courses to get enough credits and background knowledge to enter a Master’s program in Marine Science. He began working as a volunteer in labs and on commercial fishing boats to gain experience. Trey completed his thesis on yellowfin tuna and was ready to move on. Advisors warned him away from focusing on charismatic marine fauna, but his father had taught him to push back against barriers and pursue his goals. He began working as a volunteer in labs and on commercial fishing boats to gain experience. He spent 3 years earning his Ph.D. and worked in a post-doctoral position while looking for a research job. 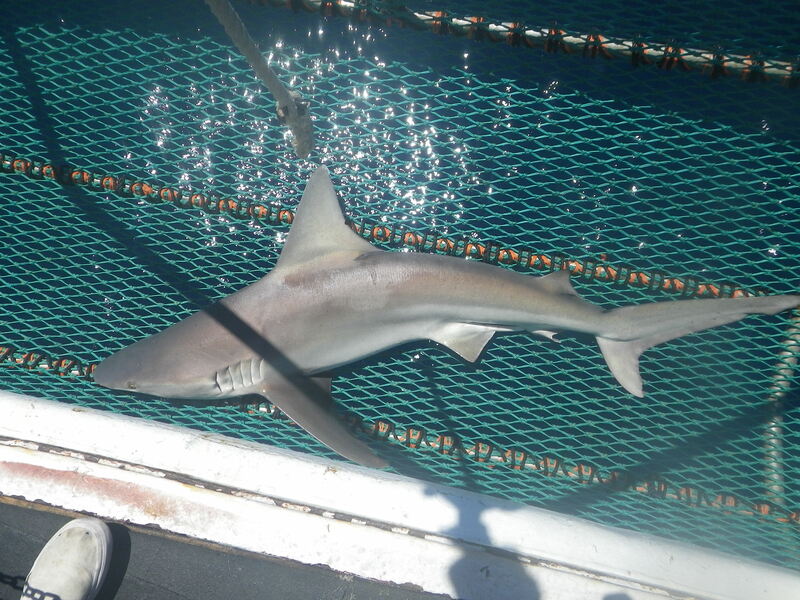 His previous volunteer work on surveys gathering information on blacknose sharks helped him get a foot in the door to get a contract position at the NOAA Fisheries Research Lab in Pascagoula. He continues research to add to our understanding of sharks and enjoys his job because he loves the challenge of not knowing all the answers. Trey’s advice to young people is to get involved in volunteering in a variety of ways so you can discover where your interests lie. That volunteer experience can demonstrate interest that will set you apart from other applicants when it comes to applying for the limited number of positions that may be available in your chosen field. 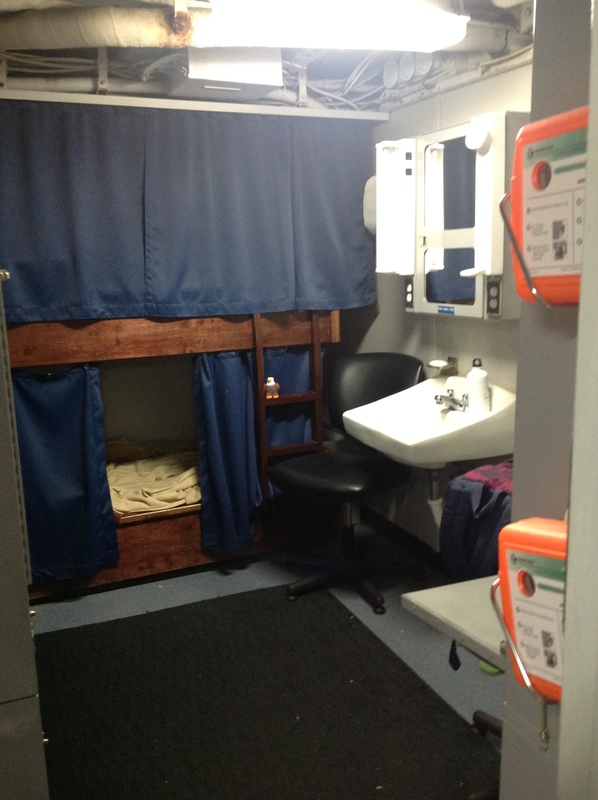 There were six unpaid volunteers aboard the ship this cruise. They provide important manpower to get the research done while gaining knowledge and experience to transfer to other areas of their lives. Most often they are students who are gathering data to use for research projects, working toward advanced degrees. 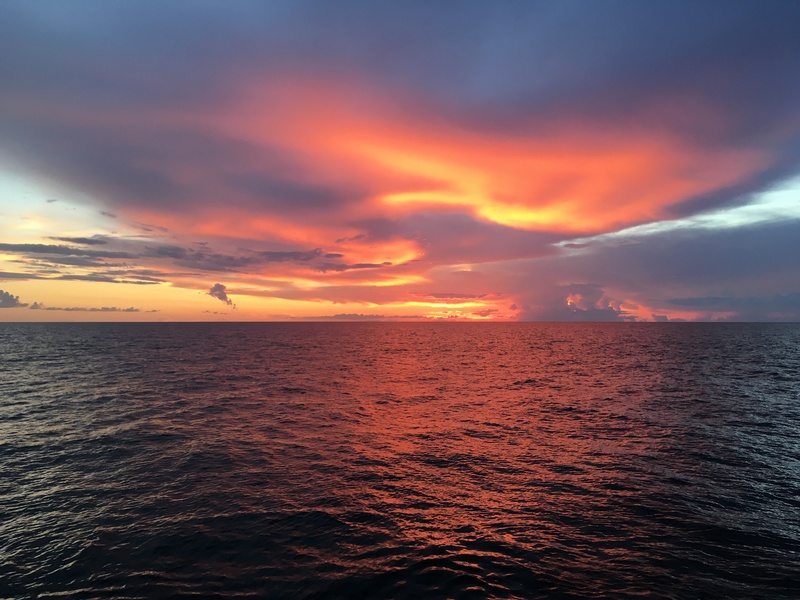 Sometimes there will be a volunteer like me, a very lucky Teacher at Sea who has been chosen by NOAA…….. to participate in the cruise to learn about the work and careers in NOAA to take that knowledge back and share it with our students and the general public. Mike Cyrana is a Post-Doctoral Student at Tulane University, working toward his PhD in Marine Biology. This is the second year he has worked with fisheries crews in the Gulf as he compiles data for his research. Mike was on my watch so we worked together 12 hours each day and got to swap stories and share information. He shows a passion for his work that lets you know he has chosen a career he loves. Mike is to blame for introducing me to chocolate tacos….my newest vice! Lydia Crawford is also a Post-Doctoral Student at Tulane University. She is doing research about sharks for her PhD in Ecology and Evolutionary Biology. Lydia was on the midnight to noon shift so our paths crossed very seldom. She is knowledgeable and willingly shared what she knows to help make our jobs easier. She also has been out on research cruises as a volunteer before and helped us newbies learn the ropes. Kasea Price, working for her MS at University of Southern Mississippi was on day shift with me and helped me wrangle sharks, dissect for otoliths and collect any number of specimens to bring home to my class. On one of our last days working together she found out that she has been hired to work for one of her professors at school, a job that will make it possible for her to complete her degree without piling up huge loans. We all celebrated for Kasea. Toni Mancinelli is the youngest of the volunteers. She is an undergraduate, just starting her junior year at The University of Tampa. She felt very fortunate to be accepted for this cruise and worked hard to learn and contribute while she participated. Her happy attitude and willingness to help made her a pleasure to know and work with. In the last few days I have had the opportunity to become better acquainted with some of the great people aboard the OREGON II. The variety of backgrounds and experiences provides richness to the culture we work in. Firstly, there is our Commanding Officer, David Nelson. Upon meeting him when I came aboard I felt immediately welcomed by his warm, informal greeting, “Hi Teach.” His drawl gives him away as a life-long southerner. His friendliness and casual manner in conversation make it easy to see him as just one of the people who work here. BUT, make no mistake: Dave Nelson is a smart, perceptive, capable leader who understands ships and crews from the keel up. CO Dave Nelson’s route to command has not been the typical college to NOAA Corp Officer track. He got where he is today by working through the ranks. After high school graduation he worked on commercial long-line and shrimp boats in the Gulf, gradually moving on to oil field supply boats. At some point he decided to look into marine work that offered worker benefits and more chance of vertical advancements. Dave had earned his card as an AB (Able Bodied Seaman) and been captain of fishing boats. He hired on as a Skilled Fisherman at NOAA and began a new phase of his career. His skills set matched the needs of NOAA well enough that he moved from deck hand to deck boss to 3rd, then 2nd officer and in 1998 he got his First Mate’s papers and became part of the wheel team. Advancement at that point began to require more formal training and certification. He had had to invest 700 days at sea with NOAA to get that first license. The big prize became the Master rank requiring an additional 1000 days at sea and rigorous formal testing. He headed to Seattle where he enrolled at Crawford Nautical School, lived aboard NOAA Ship RAINIER at Sand Point, and spent seven days a week for 10 weeks immersed in preparing to take tests for the Master rank. It was a proud day in 2003 when he called his family to report success. Today, Dave is one of only two people in command of NOAA ships who are not NOAA Corps officers. He brings to his job a depth of knowledge that positions him well to understand the challenges and rewards at every level on his ship. He appreciates the continuity possible for him because he is not subject to the mandatory rotation of postings every 2 or 3 years as are members of the Corps. He has the first-hand experience to know where the rough spots may be and to address those proactively. I am not saying other ship’s Captains don’t have those same abilities, but CO Nelson has truly earned his position working from the bottom up. Executive Officer Lieutenant Commander Lecia Salerno, born in Halifax, PA, has loved the ocean for as long as she can remember, back to family vacations at Delaware beaches in her early childhood. She vividly recalls running joyfully into the water and being lifted high in the air by family members so the waves wouldn’t crash over her head! Later, a family visit to Sea World may have been the start of her fascination with marine mammals. In her soft southern accent, no doubt developed during her undergraduate years in college at Myrtle Beach, SC, she tells of graduating with a degree in Marine Biology in 2001. She returned to Pennsylvania where she spent the summer as a volunteer at Hershey Park before moving on to Gulfport, MS, in 2002. There she trained sea lions which she remembers as uniquely intelligent and interesting to work with. Training dolphins: not so fun and that changed her attitude about working with captive animals. She began to see that type of work as a dead-end so she started looking at other options. That is when she discovered NOAA Corps. For her it seemed the perfect mix of military-style structure and science at sea. Now, several years into her NOAA career, she views her role as being a “science facilitator.” Her daily work is with management of people and resources. She is mostly in an office and does not work in the science lab. 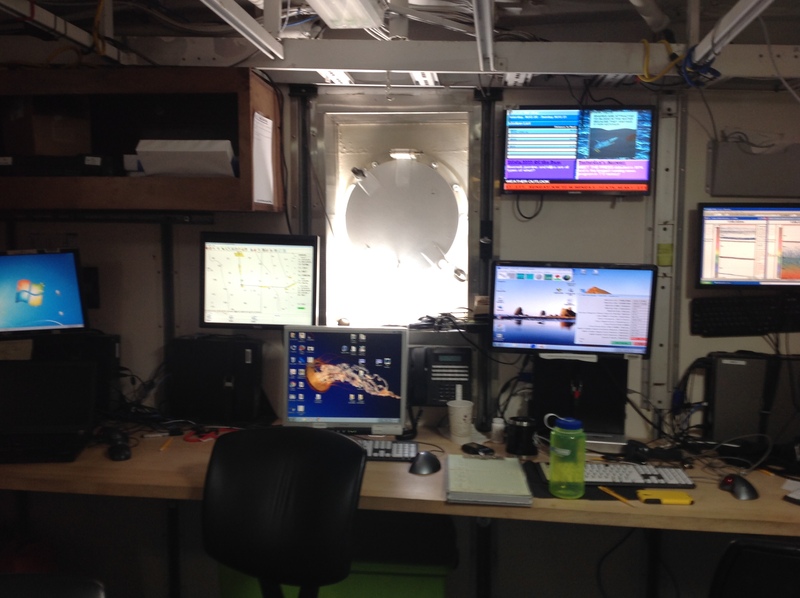 Rather, she helps organize the support necessary to make the science at sea possible. Lieutenant Reni Rydlewicz worked a lot of jobs in a lot of places before she became a NOAA Corps Officer. Raised in Milwaukee, Wisconsin, she attended the University of Wisconsin – Whitewater and graduated with a degree in Ecology Field Biology. An early goal of hers was a move to Alaska so after graduation she worked as a contracted observer on commercial fishing boats in the Bering Sea and Gulf of Alaska. NOAA Fisheries employs regional contractors all over the country so next she moved to Chincoteague, Virginia, where she also worked as an observer on fishing boats. Then, for a few years, she was back in Wisconsin conducting seasonal work for the state Department of Natural Resources collecting data on recreational catches on Lake Michigan including salmon and steelhead. 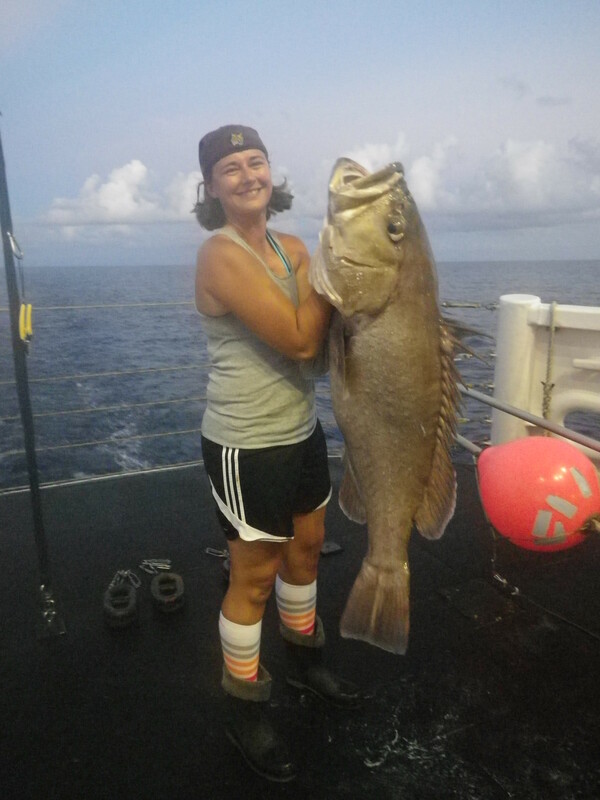 Eventually Reni moved to New Jersey to a position as a coordinator for the mid-Atlantic observer program, working hand in hand with the commercial fleets and managing biologists aboard the vessels to gather data for NOAA Fisheries. After a change in contractors a few years later, she again found herself in Virginia, this time working as a dockside monitor for recreational species. By this time Reni had spent almost a decade as a contract worker on NOAA jobs. A retired NOAA Corp Captain in her local American Legion suggested that she apply to NOAA Corps based upon her experience. With that encouragement she met with a NOAA recruiter on a trip to Washington DC and has now been working on fisheries research ships as a NOAA Corps Officer for over seven years. 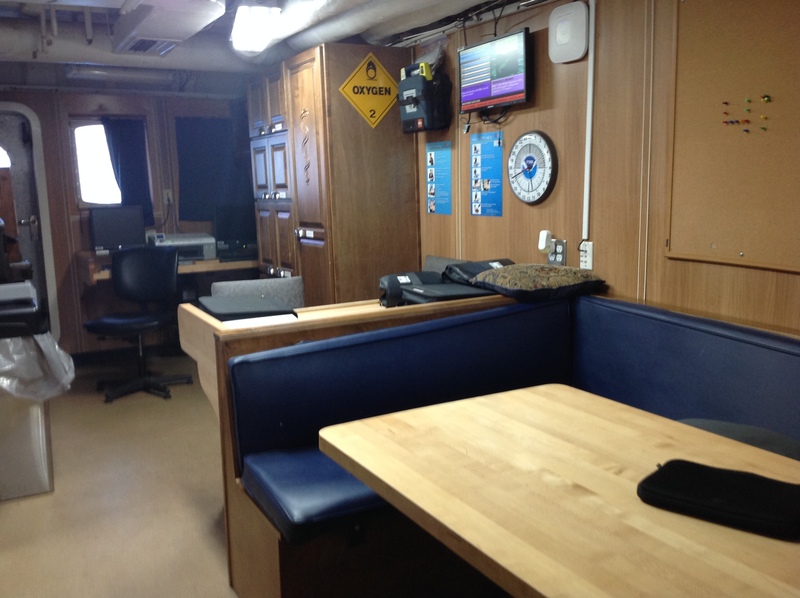 She is currently the Operations Officer aboard NOAA Ship Oregon II. Reni has considered returning to college to earn an advanced degree, but juggling work and school can sometimes be a difficult process. She will soon be due to rotate to a land-based assignment for the next three years and is considering positions on the West Coast, continuing her work with NOAA Fisheries. Ensign Brian Yannutz is another young person from the central part of the United States who has chosen marine science as a career. Raised in Colorado, he went to University of Hawaii with assistance from the NOAA Ernest F. Hollings Undergraduate Scholarship Program. He earned his degree and presented his work in Washington DC, then returned to Hawaii where he worked on a temporary job in the NOAA Marine Debris Program. In 2014 he applied to NOAA Corps and was graduated from the Coast Guard Academy in December 2014. Brian’s first assignment is the OREGON II where he will be until December of this year. His land-based assignment will be as an Operations Officer at the Monterey Bay National Marine Sanctuary in California. His job there will have him working with schedules and boat maintenance. He will be the officer in charge of deployments on the two research boats stationed there, one a fisheries boat and the other a diving platform. Outside of his work for NOAA, Brian is an enthusiastic runner. He ran cross country in school and since then has run marathons and ironman races. His advice to young people getting ready to find a career is to “follow your dreams and passions.” His have led him to a career in NOAA where he can travel, learn and grow with his job. Ensign David Reymore can be described as the “renaissance man.” He grew up mostly on a small family ranch in Tonopah, NV. His high school years were spent rodeo riding: team roping, calf roping and saddle bronc riding. After high school he continued to enjoy rodeo as he worked as a farm mechanic rather than enter the family construction business. Eventually he enrolled at Embry Riddle Aeronautical University and earned a degree in aeronautical science. While in college he joined Air Force ROTC, but after a visit from a Navy ROTC recruiter, he switched to the Navy and earned a scholarship to Officer Candidate School. Dave remained in with the Navy, on active duty, and then as a civilian flight test engineer until 2008. The next step was to enroll in premed training at University of West Virginia, but the demands of supporting his young and growing family made it more important to settle immediately into a job with benefits and advancement opportunities. For the next several years, after completing training, he worked as an engineer for Burlington Northern Santa Fe Railroad, running mainly between Vancouver, Tri-Cities, Wenatchee, and Seattle, WA. Still eager to learn and grow, NOAA Corps caught his eye and he spent 5 months at the US Coast Guard Academy in officer corps training to become an Ensign in NOAA Corps. What’s next? Dave has his heart set on getting back in the air and has been accepted into training to join the NOAA Aviation team. Maybe he will be flying small planes that do aerial surveys of marine mammals, using helicopters, or even flying with the Hurricane Hunters. At this point, the sky is the limit. This is a long-line survey. That means we go to an assigned GPS point, deploy hi-flyer buoys, add weights to hold the line down, add 100 baited hooks, leave it in place for an hour, and retrieve everything. 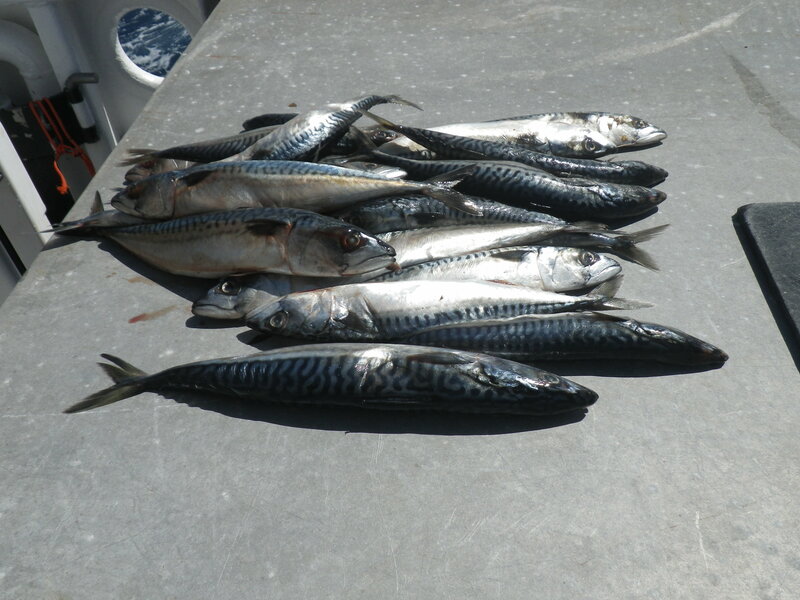 Mackerel is used to bait the hooks. As the equipment is pulled in we identify, measure and record everything we catch. 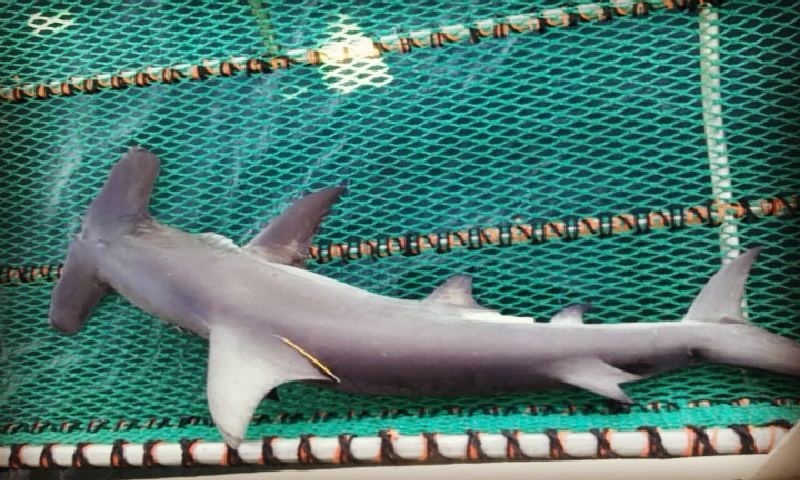 Sometimes, like in the case of a really large, feisty shark that struggles enough to straighten or break a hook or the lines, we try to identify and record the one that got away. We tag each shark so that it can be identified if it is ever caught again. We tally each hook as it is deployed and retrieved, and the computer records a GPS position for each retrieval so scientists can form a picture of how the catch was distributed along the section we were fishing. The target catch for this particular survey was listed as sharks and red snapper. The reality is that we caught a much wider variety of marine life. We list our catch in two categories: Bony fish, and Sharks. The major difference is in the skeletons. Bony fish have just that: a skeleton made of hard bone like a salmon or halibut. Sharks, on the other hand, have a cartilaginous skeleton, rigid fins, and 5 to 7 gill openings on each side. Sharks have multiple rows of sharp teeth arranged around both upper and lower jaws. Since they have no bones, those teeth are embedded in the gums and are easily dislodged. This is not a problem because they are easily replaced as well. There are other wonderful differences that separate sharks from bony fish. 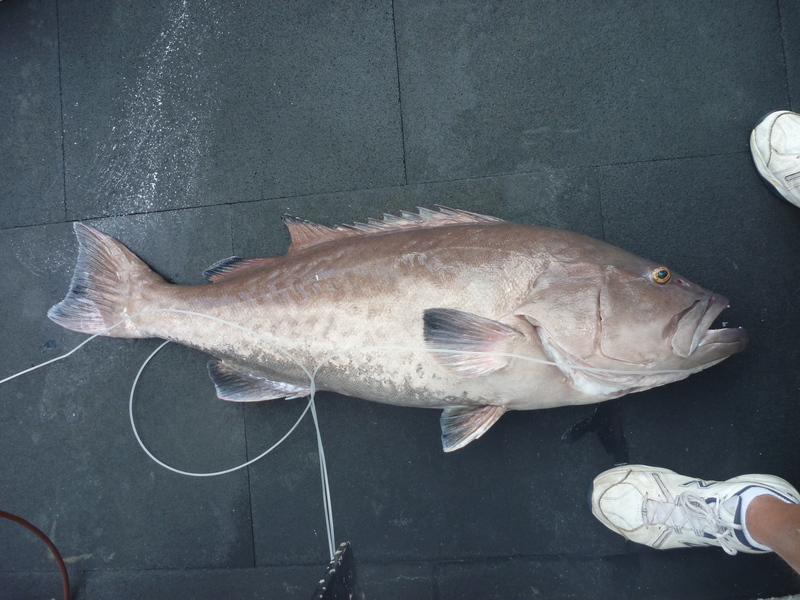 The most common of the bony fish that we caught were Red Groupers (Epinephelus morio), distinguished by of their brownish to red-orange color, large eyes and very large mouths. Their dorsal fins, especially, have pointed spikes. We also caught Black Sea Bass (Centropristus striata) which resemble the groupers in that they also have large mouths and prominent eyes. A third fish that resembles these two is the Speckled Hind (Epinephelus drummondhayi). It has a broad body, large mouth and undershot jaw giving the face a different look. 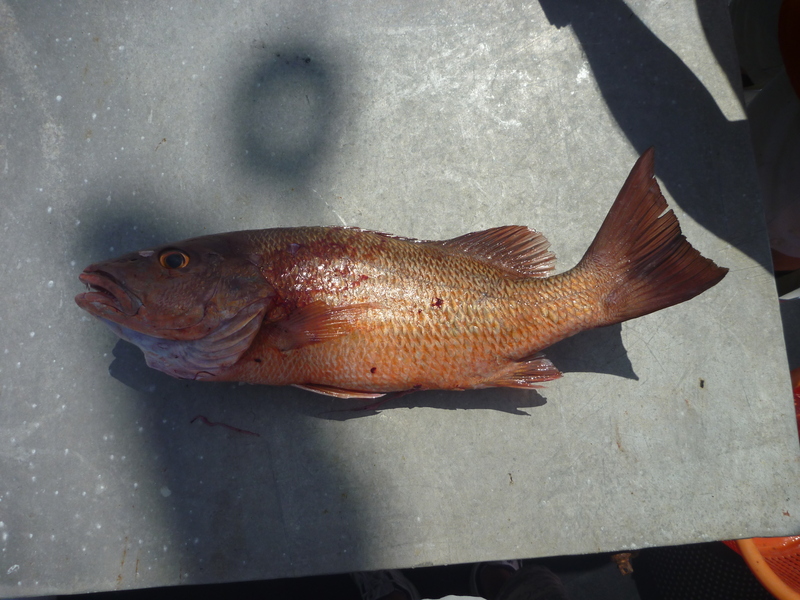 Yes, we did catch several Red Snapper (Lutjanus campechanus), although not as many as I expected. Snappers are a brighter color than the Red Groupers, and have a more triangular shaped head, large mouth and prominent canine teeth. 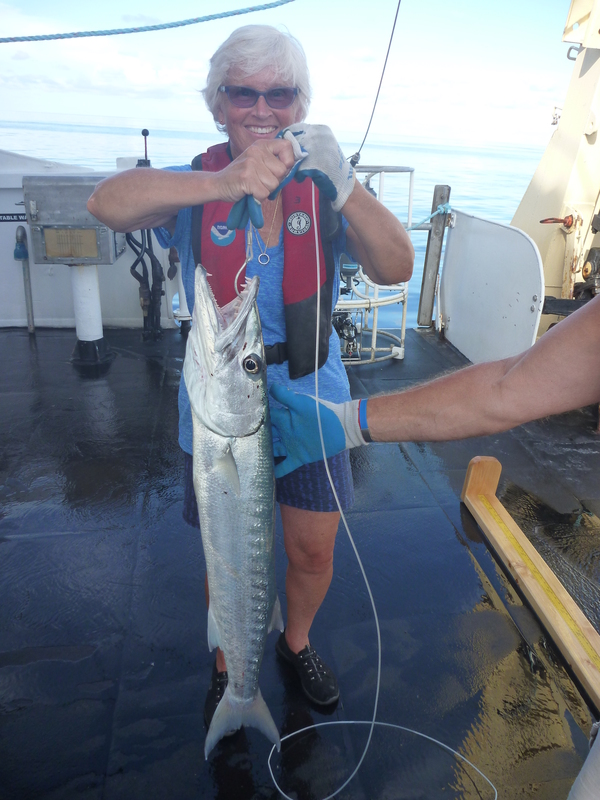 The most exciting bony fish we caught was barracuda (Sphyraena barracuda). We caught several of these and each time I was impressed with their sleek shape and very sharp teeth! Most of the bony fish we caught were in fairly deep water. We were fortunate to catch a variety of sharks ranging from fairly small to impressively big! The most commonly caught were Sandbar Sharks (Carcharhinus plumbeus): large, dark-gray to brown on top and white on the bottom. Unless you really know your sharks, it is difficult for the amateur to distinguish between some of the various types. Experts look at color, nose shape, fin shape and placement, and distinguishing characteristics like the hammer-shaped head of the Great Hammerhead (Sphyrna mokarran) and Scalloped Hammerhead (Sphyrna lewini) sharks that were caught on this trip. The beautifully patterned coloring of the Tiger Shark (Galeocerdo cuvier) is fairly easy to recognize and so is the yellowish cast to the sides of the Lemon Shark (Negaprion brevirostris). Other sharks we caught were Black-nose (Carcharhinus acrontus), Atlantic Sharp-nosed (Rhizoprionodon terraenovae), Nurse Shark (Ginglymostoma cirratum), Blacktip (Carcharhinus limbatus) and Bull Sharks (Carcharhinus leucus). Several of the sharks we caught were large, very close to 3 meters long, very heavy and very strong! 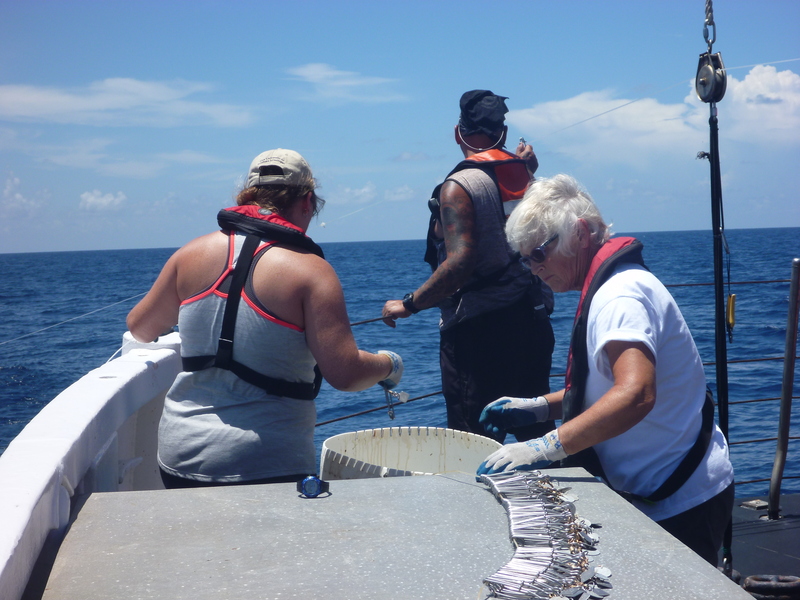 Small sharks and bony fish were brought aboard on the hooks to be measured against a scaled board on the deck then weighed by holding them up on a spring scale before tagging and releasing them. Any shark larger than about 1.5 meters was usually heavy and strong enough that it was guided into a net cradle that was lifted by crane to deck level where it could be measured, weighed and tagged with the least possibility of harm to either the shark or the crew members. Large powerful sharks do not feel the force of gravity when in the water, but once out of it, the power of their weight works against them so getting them back into the water quickly is important. Large powerful sharks are also pretty upset about being caught and use their strength to thrash around trying to escape. The power in a swat from a shark tail or the abrasion from their rough skin can be painful and unpleasant for those handling them. I am standing alone on the well deck; my head is buzzing with the melodies of the Eagles and England Dan. A warm breeze brushes over me as I tune out the hum of the ship’s engines and focus on the rhythm of the bow waves rushing past below me. It is dark! Dark enough and clear enough that I can see stars above me from horizon to horizon: the soft cloudy glow of the Milky Way, the distinctive patterns of familiar favorites like the Big Dipper and the Little Dipper with its signature bright point, the North Star. Cassiopeia appears as a huge “W” and even the tiny cluster of the “Seven Sisters” is distinct in the black bowl of the night sky over the Gulf of Mexico. The longer I look the more stars I see. This is one of the first really cloudless nights of this cruise so far. Mike Conway, a member of the deck crew came looking for me to be sure I didn’t miss out on an opportunity to witness this amazingly beautiful show. As I first exited the dry lab and stumbled toward the bow all I could pick out were three faint stars in the bowl of the Big Dipper. The longer I looked, the more my eyes grew accustomed to the dark, and the more spectacular the show became. Soon there were too many stars for me to pick out any but the most familiar constellations. As a child I spent many summer nighttime hours on a blanket in our yard as my father patiently guided my eyes toward constellation after constellation, telling me the myths that explained each one. Many years have passed since then. I have gotten busy seeing other sights and hearing other stories. I had not thought about those long ago summer nights for many years. Tonight, looking up in wonder, I felt very close to Pop again and to those great times we shared. Teacher at Sea Barney Peterson working on line long deployment aboard the OREGON II. NOAA is a big organization! To say I am working for NOAA this summer is like saying I am visiting the USA…way too non-specific to mean much. NOAA (National Oceanic and Atmospheric Administration) is a part of the US Department of Commerce. The NOAA mission: Science, Service and Stewardship, is further stated simply as to understand and predict changes in climate, weather, oceans and coasts; to share that knowledge and information with others; to conserve and manage coastal and marine ecosystems and resources. To carry out that mission NOAA is further split into divisions that use a broadly diverse set of skills and abilities including satellite systems, ships, buoys, aircraft, research, high performance computing, and information management and distribution systems. * In later posts I will introduce you to some of the people who use those resources as they perform their jobs. To understand what that last statement means, find a globe or an inflatable Earth Ball™. Put your index finger on a point in the Arctic Ocean. Now move your finger around the globe, always moving to your right, maybe a little up or down sometimes, until you get back to where you started. Your finger should never leave the “water” as it moves around the world. See! JUST ONE BIG OCEAN! There is just one big ocean. 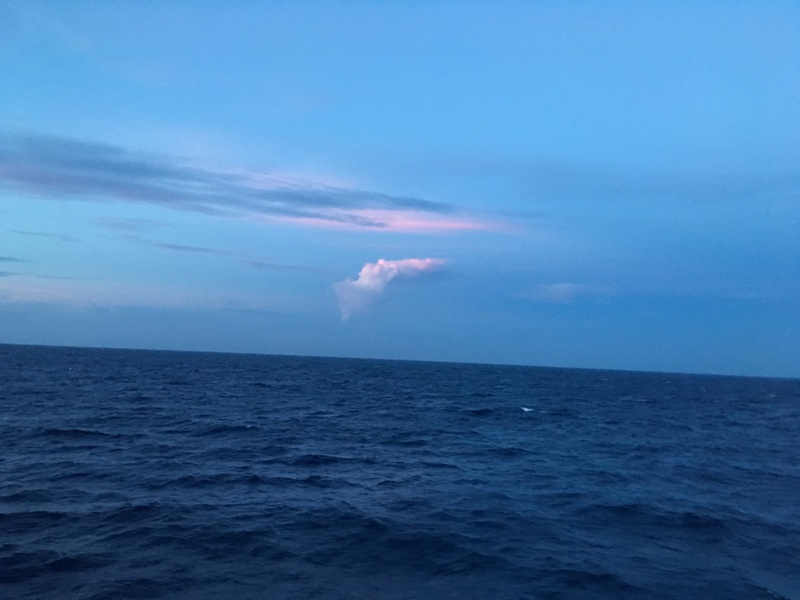 About mid-morning today the ship’s electrician found me to tell me that the night shift crew had just reported seeing a Sea Turtle near the line that they were currently deploying. The turtle swam over the line and then dove toward the baited hooks some 30 meters down near the bottom. Nobody is supposed to catch Sea Turtles; the stress of being on the hook can be fatal so immediate recovery and release is required in the case of an accidental catch. The crew went into immediate pro-active rescue mode! 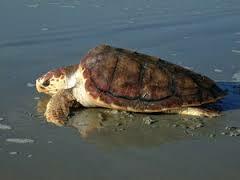 File photo of a Loggerhead Turtle. The deployment was stopped. The line was cut and a final weight and a second hi-flyer were deployed to mark the end of the set for retrieval. The Captain altered course to bring the ship back around to a point where we began retrieving the line. Crew moved to the well deck and prepared the sling used to retrieve large sharks; it would be used to bring a turtle gently to the deck in the event that we had to remove a hook. As retrieval started and gangions were pulled aboard, it became obvious that this set was in a great location for catching fish. 8 or 9 smallish Red Grouper were pulled in, one after another. Many of the other hooks were minus their bait. The crew worked the lines with a sense of urgency much more intense than on a normal retrieval! If a turtle was caught on a hook they wanted it released as quickly as possible to minimize the trauma. As the final hi-flyer got closer and the last of the gangions was retrieved, a sense of relief was obvious among the crew and observers on the deck. The turtle they spotted had gone on by without sampling the baited hooks. On this ship there are routines to follow and plans in place for every emergency. The rescue of an endangered animal is attended to with the same urgency and purpose as any other rescue. The science and deck crews know those routines and slip into them seamlessly when necessary to ensure the best possible result. This is all part of how they carry out NOAA’s mission of stewardship in our oceans. Chrissie works the midnight to noon shift and I work noon to midnight so the only time we really see each other is at shift change. Together, we are responsible for keeping our space neat and clean and respecting each other’s privacy and sleep time. 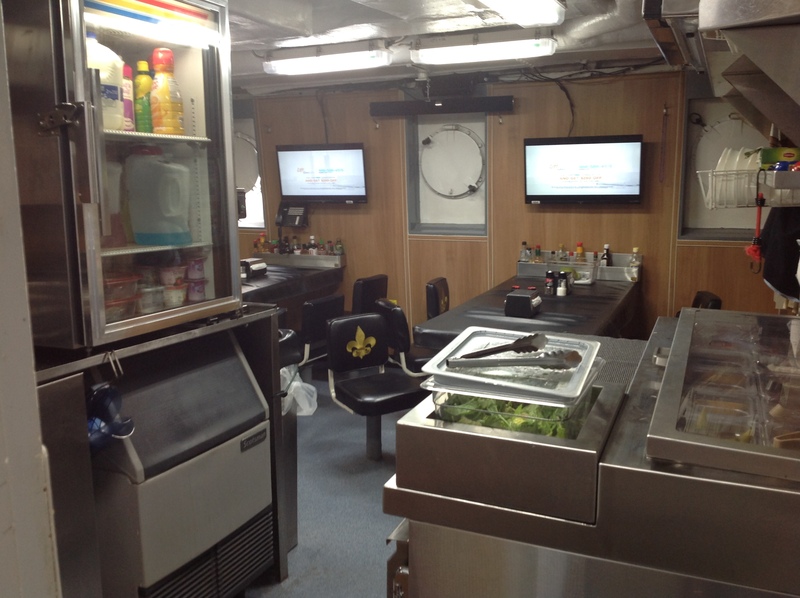 I eat in the galley, an area open to all crew 24/7. Meals are served at 3 regular times each day. The food is excellent! If you are on shift, working and can’t break to eat at meal time, you can request that a plate be saved for you. The other choice for those off-times is to eat a salad, sandwich, fruit or other snack items whenever you need an energy boost. We are all responsible for cleaning up after ourselves in the galley. Our Chief Steward Valerie McCaskill and her assistant, Chuck Godwin, work hard to keep us well-fed and happy. Everyone on the ship shares space in the galley where seats are decorated with the symbol of the New Orleans Saints… somebody’s favorite team. There is a lounge, open to everyone for reading, watching movies, or hanging out during down time. There is a huge selection of up-to-date videos available to watch on a large screen and a computer for crew use. Another place to hang out and talk or just chill, is the flying deck. Up there you can see for miles across the water while you sit on the deck or in one of two Adirondack chairs. Since the only shade available for relaxing is on this deck it can be pretty popular if there is a breeze blowing. During off-duty times we can read, play cards or watch movies in the lounge. 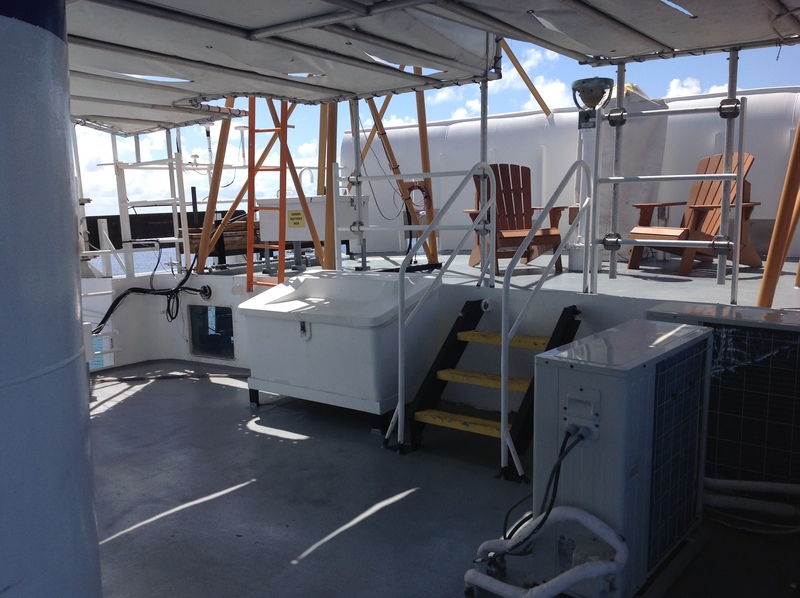 The flying bridge is a place to relax and catch a cool breeze when there is a break in the work. the wet lab which so far on this cruise, has been used mainly for getting ready to work on deck, but has equipment and storage space for processing and sampling our catch; the stern deck where we bait hooks and deploy the lines and buoys; the well deck at the front of the ship where lines and buoys are retrieved, catch is measured and released or set aside for processing, and the CTD is deployed/stored for water sampling. We move between these areas in a rhythm dictated by the pace of our work. In between deployments we catch up on research, discuss procedures, and I work on interviews and journal entries. I am enjoying shipboard life. We usually go to bed pretty tired, that just helps us to sleep well. The amazing vistas of this ocean setting always help to restore my energy and recharge my enthusiasm for each new day. Beautiful sunsets are the payoff for hot days on the deck. The fishing process on the ship repeats itself in a well-defined cycle: cut bait, bait 100 hooks, drop hi-flyer, drop weight, attach 50 tags and baited hooks, drop weight, attach 50 more tags and hooks, drop weight, deploy hi-flyer. Put the CTD over the side and retrieve for water quality data. Wait an hour. Retrieve hi-flyer, retrieve weight, pull in first 50 hooks and detach tags logging any catch as they come in, retrieve weight, pull in next 50 hooks and detach tags logging any catch as they come in, retrieve last weight, retrieve last hi-flyer. Process the catch as it comes in, logging tag number, gender, species, lengths at 3 points, life stage, and tag number if the catch is a shark that gets tagged, return catch to water alive as quickly as possible. Transit to the next sample site. Wash, rinse and repeat. That boils it down to the routine, but long line fishing is much more interesting and exciting than that! Bait we use is Atlantic Mackerel, caught farther north and frozen, thawed just before use and cut into 3 pieces per fish. A circle hook is inserted through each piece twice to ensure it will not fall off the hook…this is a skill that takes a bit of practice. Sometimes hooks are pulled in with bait still intact. Other times the bait is gone and we don’t know if it was eaten without the hook catching, a poor baiting job, or more likely eaten by smaller fish, too little to be hooked. When we are successful we hear the call “FISH ON!” and the deck comes alive. The line with a catch is pulled up as quickly and carefully as possible. Some fish are not securely hooked and are lost between the water and the deck…not what we want to happen. If the catch is a large shark (generally 4 feet or longer) it is raised to the deck in a sling attached to the forward crane to minimize the chance of physical injury. For large sharks a camera with twin lasers is used to get a scaled picture for estimating length. There is a dynamometer on the line between the sling and the crane which measures pressure and converts it to weight. Both of these processes help minimize the time the shark needs to be out of water with the goal of keeping them alive to swim away after release. A tag is quickly attached to the shark, inserted under the skin at the base of the second dorsal fin. A small clip is taken from a fin, preferably from the pelvic fin, for DNA studies. The sling is lowered back to the water and the shark is free to swim away. All data collected is recorded to the hook-tag number which will identify the shark as to geographic location of the catch. 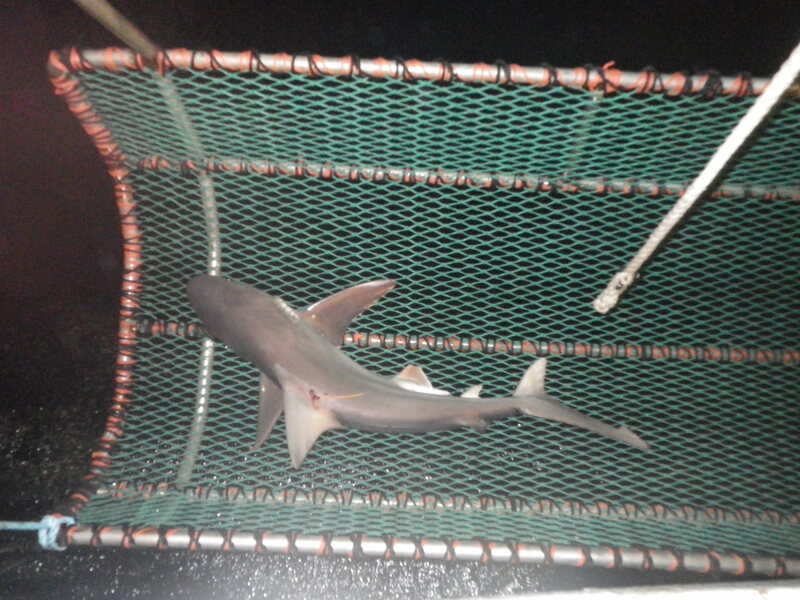 A sandbar shark being held in the sling for measurements. Sometimes the catch is a smaller shark or a bony fish: a Grouper, a Red Snapper, or any one of many different types of fish that live in this area. Each of these is brought onto the deck and laid on a measuring board. Species, length, and weight are recorded. Fin clips are taken. Many of them are on the list of species of recreational and commercial importance. These fish are retained for life history studies which will inform future management decisions. In the lab they are dissected to retrieve otoliths (ear stones) by which their age is determined. Depending upon the species, gonads (the reproductive organs) may be saved for study to determine the possibilities of future reproductive success. For certain species a good-sized piece of flesh is cut from the side for fraudulent species voucher library use. After the smaller sharks are measured, fin clipped, gender identified, life stage is determined and weight is taken, they are tagged and returned to the water as quickly as possible. Tags on these sharks are a small, numbered plastic tag attached by a hole through the first dorsal fin. This is a lot to get done and recorded and it all happens several times each shift. The routine never varies. The amount of action depends upon the success of the catch from any particular set. This goes on 24 hours per day. The only breaks come as we travel between the sites randomly selected for our sets and that time is generally spent in the lab. I do not need 12 hours of sleep. That means I have several hours at the start or end of each shift to write in my journal, talk to the other members of the crew, take care of personal business such as laundry and communicate with home via email. Even so, every day seems to go by very quickly and I go to bed thinking of all the things I have yet to learn. In my next posts I will tell more about the different kinds of sharks and introduce you to some of the other people on the ship. Stay tuned.